Tasmania is an island state some 300 kms south of the Australian mainland, with a population of about 650,000 people and an area of about 68,000 square kilometers. Much of the state is wilderness which remains unchanged since being cut off from the mainland some 13,000 years ago. The island was first described by Abel Tasman, a Dutch explorer in 1642. Although aboriginals tribes appear to have lived on the island for some 35,000 years it wasn't until the very early 1800's that a convict colony and cities were established by the British Government. Convict transportation ceased in the mid 19th C, and after the fabulous gold discoveries of New South Wales and Victoria, a high priority was placed upon mineral exploration and discovery to generate state income. Towns sprung up all over the state, mining tin, copper, lead, silver and gold. The bulk of the discoveries were on the West coast of the island. The towns of Zeehan, Queenstown, Waratah and Rosebery were (and still are) centres of large scale mining ventures. The climate and geography is inhospitable, with over 5000mm (200 inches) of rain falling throughout the year in some places. Snow often blanketed the high peaks protecting the orebodies in winter and savage gales whipped the coastline with few safe harbours. Few roads were cut into the wilderness, with many impassable in winter. The wealth of the large mines last century financed the construction of many light gauge railways throughout the forests and gorges, to transport goods and ore to the nearest ports. Although many now in hindsight were folly, because of the huge costs and maintenance required to run them, they managed to open up vast areas of otherwise uneconomic ground to smaller mining companies. The town of Zeehan, named after one of discoverer Abel Tasman's ships, grew after silver-lead deposits were discovered there in 1882. By 1901, Zeehan had 26 hotels and a population of 10,000, the third largest town in Tasmania. Today it is more reminiscent of a sleepy village. The past glories of mining can still be seen in a number of fine buildings gracing the main street, but those days are long gone. Today a glimpse of this can be seen in the old Zeehan School of Mines Building, which houses the West Coast Pioneers Memorial Museum. Here visitors can see the old locomotives, mining equipment and displays and a very high quality mineral display. 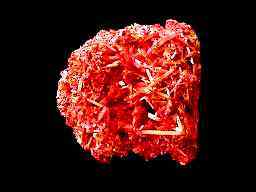 And of course CROCOITE! 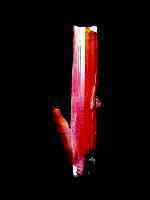 Fabulous large crystallised specimens may be seen, with brilliant red needle-like crystals up to 18cm long. Large matrix specimens up 30cm dazzle the eyes. 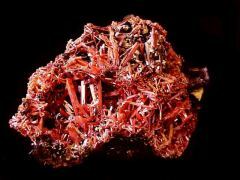 Crocoite has been named Tasmania's state mineral emblem. 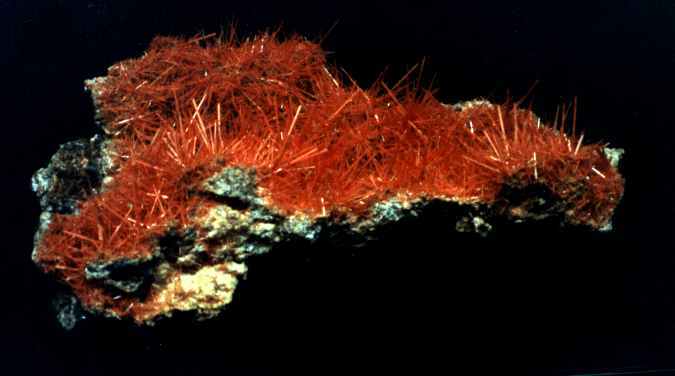 Crocoite was discovered in Tasmania about 1896, by James Smith and W.R. Bell. Prior to this, it had been recorded in a number of places in the world, with specimens occuring in Russia, Romania, Rhodesia, California and Arizona. 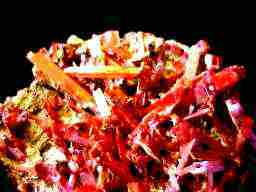 These specimens pale into insignificance compared to the magnificent red/orange jackstraw specimens that were now discovered at a number of mines principally centred at Dundas. The name 'Dundas' is synonymous with Crocoite, but anyone wishing to find this place today will be sadly disappointed. The locality refers to a site long since lost to the wilderness that has swallowed up the mines of the area. Late last century, miners burrowed into the hillsides of Dundas and struck a particularly strange orebody. 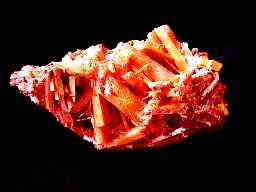 In search of lead and silver, the brown/black gossan overburden they discovered, was honeycombed with cavities containing cerussite and a strange beautiful red mineral, later identified as crocoite, the rare chromate of lead. 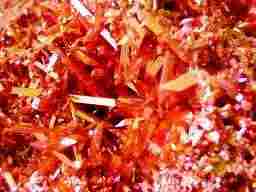 Mines such as the 'Adelaide', 'Red Lead', 'West Comet' and 'Dundas Extended' burrowed into this rich gossan hill and sent huge amounts of crocoite and cerussite by oretrain to the smelters. Once through the oxidised zones, and deep into the orebodies, the metal content of the ores gradually petered out, and the huge costs involved in pumping out the large volumes of water from the mines gradually killed off them off one by one, until the last closed early this century. The mines returned to wilderness until enterprising mineral collectors, appreciating the beauty and value of the specimens, decided to reopen some of the mines for mineral specimen mining. The most successful of these mines has been the 'Adelaide' Mine. The 'Adelaide' lease has been held by Frank Mihajlowits since the 1970's and in this time some magnificent specimens have been won from the mine. Frank lives in the main street of Zeehan, and a billboard outside his house proclaims 'Crocoite Specimens for Sale'. A wiry character, still speaking with a European accent, with tough leathery skin from years of underground toil and hard-living, Frank has a wealth of hard-won knowledge on crocoite, as well as some magnificent specimens for sale. Boxes of specimens are arranged on benches around his shed in differing states of cleaning. Prices are by negotiation, with the best pieces selling for many thousands of dollars, although some lovely specimens can be had for $50.00 that would grace many collections. He is reticent about taking visitors to the mine, but if you buy a few of his pieces (or perhaps supply a carton of beer!) he may be amenable. 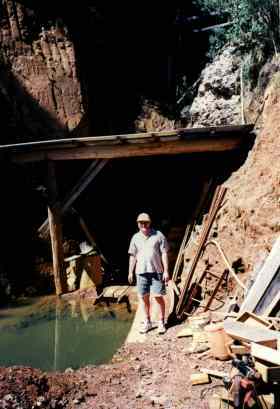 The day we visited, Frank, he was on the way to check out the minesite, and so we were able to tag along. The track into the mine, about 12 kms from Zeehan, is 4wd only in wet weather, and contains a number of locked gates to keep undesirable fossickers out! Once at the mine we donned hardhats and lamps and followed Frank into the lower adit. Tiny needles of crocoite glistened in the lights everywhere. A thick brown mud covers everything, and a trickle of water flows out between our feet as we troop single file into the drive. 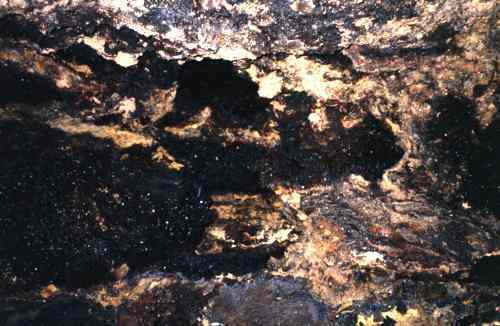 Franks explains that the main shaft goes down many hundreds of feet, but that the crocoite only occurs in these upper levels which he has reopened and timbered. A number of large vughs showing 10cm needles extend into blackness overhead, lit by our lights. They are unfortunately coated in a black siliceous coating that renders them uncleanable! The best vughs are those where this coating has failed to adhere. A coating of white china clay and Gibbsite coats the best pieces, and this must be removed carefully with a concoction of chemicals to produce the sparkling pieces seen for sale. The drives on upper levels are reached by precarious step ladders. A flooded lower drive is pointed out as having provided the last 'glory hole'. Our visit is in the summer months and the thought of working this mine in cold, wet and extremely muddy conditions in the middle of winter made me realise that those prices we pay for specimens aren't really that bad at all when one realises the effort required to extract them. 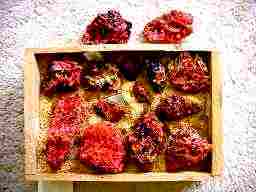 Fine specimens of crocoite from the 'Adelaide' Mine. Largest specimens 20cm. Single crystal (hollow straw hopper habit) 4cm. Click the last image to enlarge. Back out and into the sunlight, we specked a few specimens from an all-enveloping muddy spoil heap outside the adit, before thanking Frank for a great experience.